My Mac went AWOL on me a few days ago and won't let me open more than one window at a time - the dock has completely disappeared! This means I can't write any posts that require some sort of research and don't want to take it to the scary big Apple store on Regents St as they will take my beloved laptop away from me for about a week. But I won't let this post to go to waste - I've got some UK news. 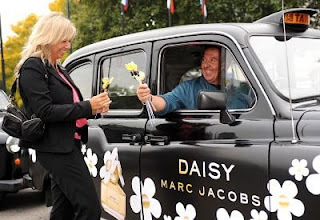 Between 22nd September - 19th October Marc Jacobs has transformed the traditional cabbies in London, Manchester, Birmingham and Edinburgh into cute little daisy chains, adorning them with flowers to celebrate the first anniversary of his Daisy perfume. Inside tip seats will be decorated in daisy fields and smell of Daisy eau de parfum, aswell as lollipops given to each passenger awww! Now I just have to find an excuse to use a cab instead of my travelcard in that time period. really cute idea- i wish i could ride in one!